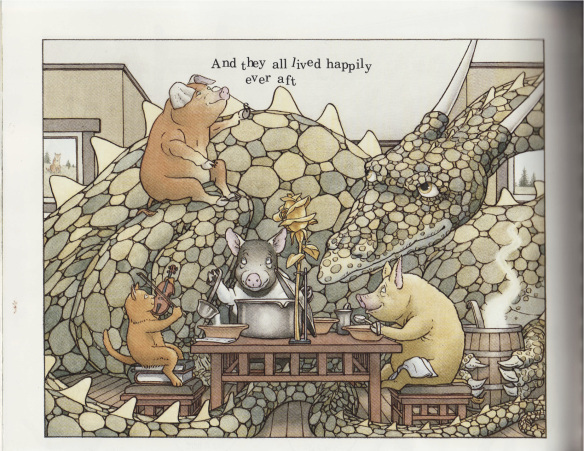 Dana: David Wiesner’s The Three Pigs might just look like a retelling of the story of the three little pigs. And it is, only this time the pigs are the ones doing the telling. When the wolf comes to visit the pig who built his house of straw, he huffs and he puffs and—he blows the pig right out of the story. Straw Pig figures out how to take his brothers with him, and they go on a trip through a bunch of other stories before they finally land back at home, in the brick house, where they literally arrange the words of their happy ending on the page themselves. So, yeah, this is a picture book. But picture books are brilliant because they can do things by combining words and pictures that novels just can’t. I first came across this book when I was in college working on a paper for a class on graphic narrative, and since then I’ve written three different papers about it (I don’t know how Serena and I both got so lucky that we get to be graded on what we think about our favorite books). It’s one of the reasons I decided to build my career around children’s books. But The Three Pigs is not a book to read just because it’s been anointed by grownups who care about kids’ books. It’s a book to read because it’s about stories—all stories, for all ages—and how we tell them. 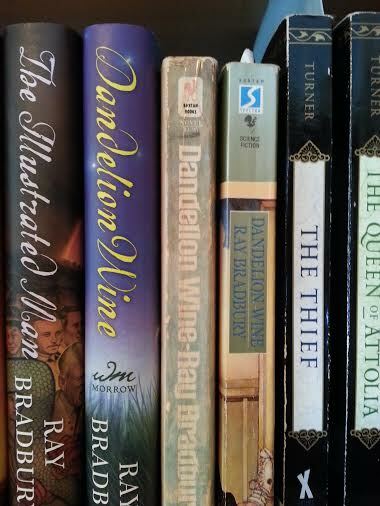 The three editions of Dandelion Wine on my shelf. Serena: When I was a junior in college, I spent an all-too-brief 24 hours in Venice, wandering around with a group of other students, oohing and aahing at everything we saw. I have never, before or since, been so completely enchanted with a place. I think I barely breathed for those 24 hours, too afraid I’d somehow shock myself back into a much less pleasant reality. Food, alcohol, conversations with my fellow travelers (usually very appealing prospects), all were just distractions from what I wanted to do, which was to never stop looking. For me, reading Dandelion Wine is like that. I’m a sucker for poetic prose, and Ray Bradbury was the master. His writing in this quiet little book breaks my heart the same way Venice did: it’s so beautiful it hurts. The first breath I drew after finishing the last sentence felt like first breath I’d drawn all day. That feeling is pretty hard to forget, and I haven’t tried. Book people everywhere will understand me when I say that picking a favorite book is pretty near impossible. But if I do have one, this is it. I don’t have the money to return to Venice (much as I’d love to, obviously), but I can keep three copies of Dandelion Wine on my shelves, and I swear that’s almost as good. This entry was posted in April 2014 and tagged about us, April 2014, dandelion wine, david wiesner, favorites, Harvard Book Store, kidlit, picture books, pigs, ray bradbury, the three little pigs, the three pigs, Venice, wine. Bookmark the permalink.